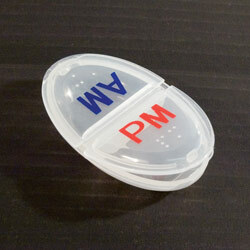 "Keep Daily Medication Conveniently in Your Pocket"
Easily carry your daily medications and vitamins with you! This compact 3" long oval mini pocket pill box has two flip-open compartments marked in both Braille and large, bold 0.44" print - 'am' in blue print on one half and 'pm' in red print on the other half. Made of clear plastic for easy viewing of contents. Measures 3.0" L x 1.75" W x 0.75" T. Weight: 0.4 oz.